Developed materials and process for using inkjet technology to coat stents with drug eluting polymer. Polymer was defined by client and we adapted this to use in a multi-solvent ink. 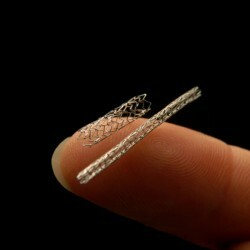 The stent handling and coating system was required to provide a uniform (+/-5%) coating thickness over the inside and outside of all stent wires. A noted researcher at a major university was developing an extraordinary lab-on-a-chip diagnostic instrument capable of responding to various biomarkers through the use of application-specific chemistries located in disposable bio-nano-chip based cartridges. 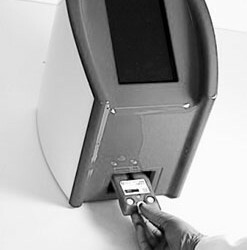 The system is comprised of a test cartridge loading and alignment subsystem, automated fluid delivery subsystem, optical analysis module, embedded PC, touchscreen human interface, and a protective outer enclosure. The client asked XACTIV to design and integrate the major elements of the instrument into a sleek unified configuration. This included integrating the electronics, embedded PC and touchscreen GUI, and providing the functional housing to complete the product design. The client planned to demonstrate his revolutionary development to important members of the research community and the National Institutes of Health, but the instrument needed to be reconfigured, assembled, and tested in only four weeks and three days. Three weeks later XACTIV and the University met their commitments and the demonstration was a resounding success.